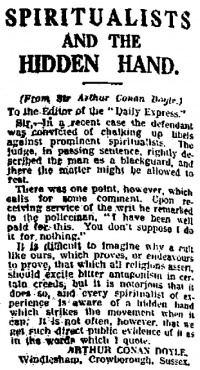 Spiritualists and the Hidden Hand is a letter written by Arthur Conan Doyle first published in the Daily Express No. 7809 on 4 may 1925. Sir, — In a recent case the defendant was convicted of chalking up libels against prominent spiritualists. The judge, in passing sentence, rightly described the man as a blackguard, and there the matter might be allowed to rest. There was one point, however, which salts for some comment. Upon receiving service of the writ he remarked to the policeman, "I have been well paid for this. You don't suppose I do it for nothing." It is difficult to imagine why a cult like ours, which proves, or endeavours to prove, that which all religions assert, should excite bitter antagonism in certain creeds, but it is notorious that it does so, and every spiritualist of experience is aware of a hidden hand which strikes the movement when it can. It is not often, however, that we get such direct public evidence of it as in the words which I quote.